Players and coaches at National League club Woking are in dispute with its board of directors over bonus payments based on their league performance. BBC Surrey understands players and management were told at the start of the season to expect bonuses as usual. But, Woking's board have since decided the bonuses will only be paid if the currently ninth-placed Cards finish in the top five promotion play-off places. Director of football Geoff Chapple insisted the issue will be resolved. "It's never helpful when matters such as these are discussed outside of any club," Chapple added. "In the meantime, the club will not be making any further statements." 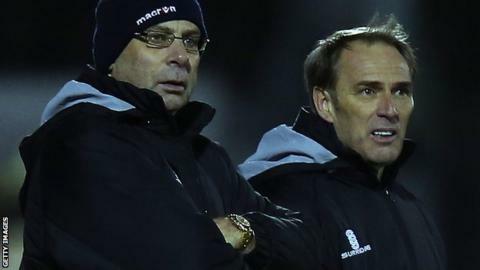 Woking's players, along with manager Garry Hill and his assistant Steve Thompson, locked themselves in the dressing-room after Saturday's 1-0 home defeat to Guiseley. They are understood to be increasingly unhappy as the club struggles financially after recording debts of £437,000 in the last financial year. Surrey-based businessman Ashley Read submitted a "statement of intent" in November to lead a consortium looking to buy a 75% stake in the club. But, the club confirmed last month that the 34-year-old had withdrawn his interest. "Woking fans will simply be wondering whether the bonus issue is just one of those problems that can surface at any cash-strapped club, or a symptom of a greater financial concern for the Cards. "Potential new owners like Ashley Read may or may not be the correct solution. But fans will hope the current owners keep them, and the management team as well, abreast of any growing financial concerns. "Expectations on the pitch must be balanced with the state of the club's accounts off it."